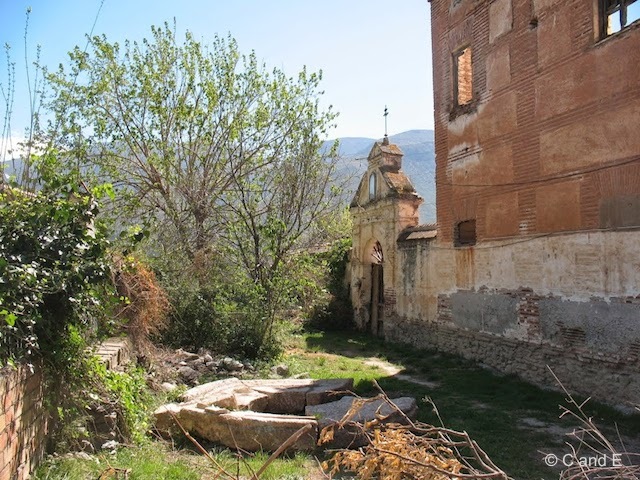 A while back, Charlotte (and Ed) from the US wrote a fabulous post about their time in Órgiva. Charlotte offered to write another one – thank you! – and we just had to say ‘yes’. As before, it will be of particular interest to those who like walking and nature. Directions below – we hope to attach a map at some stage. 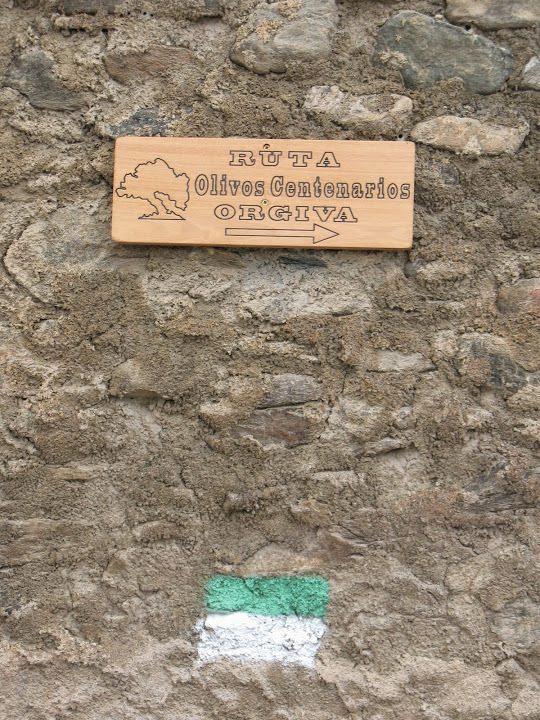 Any self-catering or travel website will tell you: Órgiva makes the perfect base for walkers. A huge variety of routes – circular, out-and-back, or long distance – awaits anyone equipped with a map and willing knees. Some of these can be pretty steep, but the huff-puffing, and burning calves will always earn you a stunning view. I often find myself walking backwards uphill so that if the vista is behind me, I can relish it all the sooner. Sometimes, however, after a lazy day of reading or people-watching in the plaza – or simply spending too much down time with your nearest and dearest – all that is needed is an easier evening leg-stretcher. My solitary stroll of choice was a loop that included the Ruta Olivos Centenarios. OK, so perhaps at four miles or so this is a bit more than a stroll, but the uphill stretch back to town doesn’t demand too much, and the peaceful downhill leg is relatively free of the Órgivan obsession with chain-link fences, which so often hinder the view. 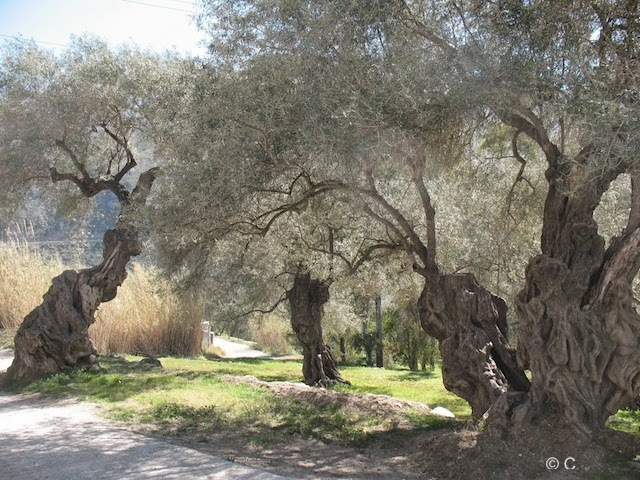 As its name makes obvious, the lane winds through grove after grove of olive trees, their gnarly centenarian trunks worthy of Arthur Rackham. A yellow house that you will want to buy gazes over terrace upon broad, beautifully landscaped terrace as they cascade down the hillside to the Rio Guadalfeo. In spring, when we were there, the clocks had just moved forward, so the evening sun slanted through the groves, setting alight yellow carpets of oxalis, speckled here and there with the nodding scarlet heads of early poppies. 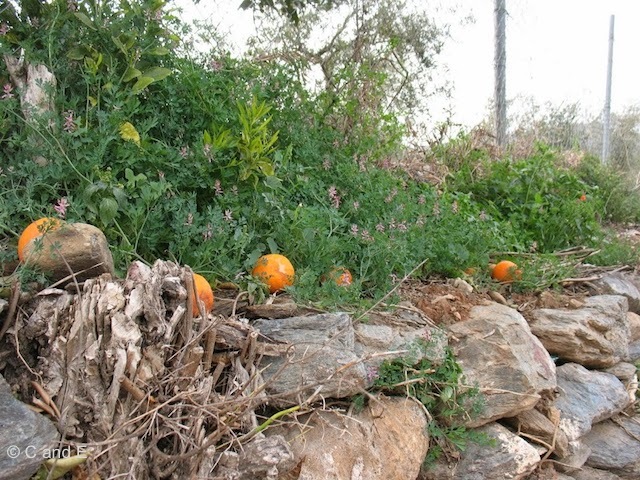 Oranges hung like splendid ornaments in the trees or rolled like dusty, abandoned cricket balls at the side of the lane. Bug-catching swallows and house martins shot through the sky, chaffinches pink-pinked among the bushes, and the Sierra de Lújar always lay ahead, looming ever higher as the road descended into the valley. So much to see, but also so much to hear. 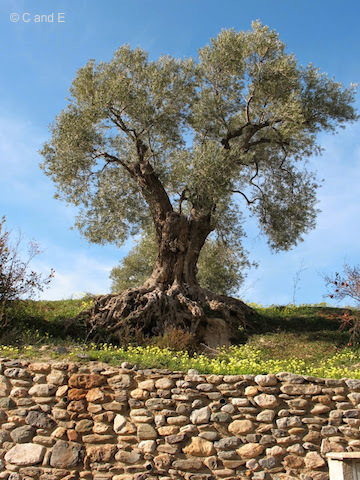 The silvery leaves of the olives vibrated with twitters, cheeps, and whistles. A donkey brayed its hee-haw from a field or two over. The cling-clong of bells carried far, signalling the approach of goats or sheep. On one evening, a herdsman was guiding his sure-footed charges in single file along the narrow bank of the acequia before they scrambled up to the lane, flowed round me like a pungent brown river, and finally branched off through the lean grey trunks of a eucalyptus grove. The strategy seems to work well for them—but on this walk, take the time to stop, look, and listen. When you get home, your spirits will be high, and perhaps, domestic harmony restored. This route, like many, starts at the small BP garage near the Post Office (as seen on this map here). Walk to the right of the garage and behind it to the left, go down the road to the river, cross the river under the bridge, and then head downstream to the left. Follow the stone wall to the Rio Chico bar, and at the fork, turn right. The sign says: Benisalte and El Morreón. Head uphill between a stone wall and a bank—What looks like a giant triffid crawling may briefly startle you, but it is just a monstrous but friendly aloe, so you can proceed safely past the Molino Benisalte. Not too far beyond the mill, make a 90 degree turn to the left (on the wall to your right, just as you make the turn, are a green-and-white painted route marker and a rather smarter wooden sign, saying, Ruta Olivos Centenarios). The turn is also marked by a concrete pole, which sports the green-and-white stripes as well as some graffiti. From here, follow the lane all the way down to the Rio Guadalfeo, watching out for a couple of opportunities to miss the route. 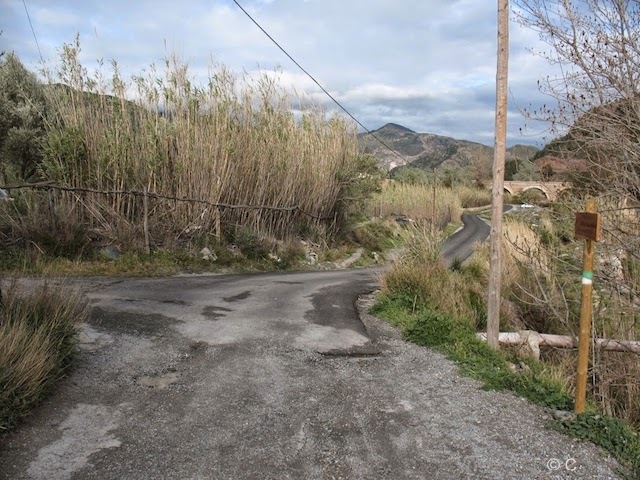 When you come to a T junction, and you are facing a yellow wall, 2 cypress trees, and no sign, turn left—the lane then bends immediately to the right. You are going around the house that is behind the yellow wall. The next junction is well marked. Turn right along a stone wall. Eventually, the road swings around almost 180 degrees to the left, just before fording the Rio Chico. Turn left after the ford, and follow the lane eastwards, ignoring the first lane that goes off to the left, until you can see the Bridge of the Seven Eyes. The lane is elevated here – running alongside an acequia and the river. Turn left right after more green-and-white and Ruta Olivos route signs, where a big pipe emerges from under the road and dumps into the acequia, and head back up to Órgiva.